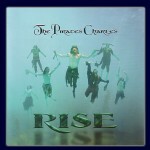 A review of The Pirates Charles’ new album Rise almost seems redundant. I mean, it’s The Pirates Charles for crike’s sake! And, as always, this album is full of “almost traditional” music akin to what pirates would have listened to if only they’d thought of it. If you’ve heard their earlier albums, then you know what I mean. And if you’ve ever seen them live, then you know it even moreso. Actually, the live thing bears some exploration. I’ve been a diehard fan of these guys ever since I first heard LIVE Scallywags. Loved it, loved it, loved it. And yet I was still in no way emotionally or intellectually prepared for seeing the jaw dropping energy that is The Pirates Charles live performance. As Spoo Diggity jumps around the stage, Deeddle rocks his mandolin, Tor shreds his fingers across his flute* – it’s just not an experience that can be conveyed with mere words. Which is why Rise does indeed set a new highwater mark for The Pirates Charles’ CD library – with THIS album, for the very first time, modern recording technology has managed to capture that energy that had previously proven so elusive. And that makes this one of the most powerful CDs in piratedom. The album begins innocently enough with a Notice of the Disclaimant, being a spoken reading of crimes and such while the rowdy crowd drinks in the background. Drain your rum now, because a brief silence follows before the album suddenly and mercilessly breaks into full speed with Mutiny of the H.M.S. Bounty. If you ignored my advice about the rum, whatever remained in your mug is now splattered across the wall (or your dance partner) as you’re now swinging your arms and legs about in reckless abandon. The album continues with other legendary tracks such as Rise of the Buccaneers, Farewell to Nova Scotia, One Mo’ Bottle o’ Rum, Rye Whiskey, and others – the pace may vary, but the insane levels of piratey awesomeness remain consistently stellar. And that’s the magic of this album. Generally speaking, pirate and sea music can be very fun. It can be melodic, comical, or haunting. It can make you dance a happy jig. But music that captures the pirate spirit like a rabid genie in a bottle is a rare beast indeed. Rise won’t make you dance, rather, it will make your heart swell with pride as your boots stomp holes into the deck. Your head will move to the music while you recklessly swing your mug or your flintlocks in the air (and hopefully avoid cracking your neighbor’s skull.) Outside observers might think what you’re doing is dancing, but you’ll know this is something significantly more primal. Buy the CD. Just go buy it already. This entry was posted in Music and tagged bilgemunky's favorites, pirates charles by Bilgemunky. Bookmark the permalink. Well SHIVER ME TIMBERS if it don’t remind me o’ JETHRO TULL!! Me Mate, Awful Annie always says me Piratey music sounds like FOLK MUSIC!!! I tossed `er te the sharks….